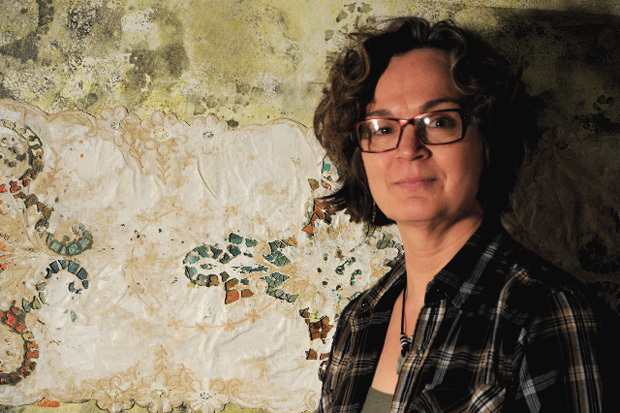 In the past 25 years, Dee Lowe has combined the making of art with farm life. She explores the extrinsic changes that occur in women’s lives in Urban and Rural environments and how these changes intrinsically effect women’s life choices. Although life changes are not limited to women’s experience, both personal experience and historical evidence have continually solidified Lowe’s notion that there is a significant lack of importance placed on domesticity, craft and child rearing. Living in a rural environment while pursuing a contemporary art practice heightened her sensitivity to cultural depictions of women in domestic environments. Dee’s medium of choice has always being painting. As such, she strives to overcome her classic formal concerns by drawing on the expertise of artists like Vermeer and Degas. This is coupled with her intrigue in traditional decorative craft that has historically been created by women (mediums such as doilies, table cloths, knit items). The result is a careful acknowledgment of the complicated nature of women’s choices displayed in a technically savvy, whimsical and esthetically appealing way. Her work effectively reflects the polarization of art and craftformally and conceptually. Her current experience living in an urban setting introduces a dialogue between those viewing the paintings about cultural dichotomies surrounding female domesticity both within the rural and urban settings as well as difficulties in balancing having a family while maintaining the status of being an independent woman. Dee Lowe acknowledges the confounding nature of women’s choices. She also faces competing and complicated interests and ideas in her own practice. The resulting artwork is comprised of a multifaceted and nuanced collection of work that collectively demonstrates a singular powerful point of view.